It was a brief, passing remark in a longer blog post, but it has piqued a disproportionate amount of interest. The quote was “and so the process of reflection begins anew, with old opinions to be revised, and new questions to answer, new mysteries to unravel.” As I’ve shared my most recent experiences in Acarigua with colleagues around the world, whether through the blog or in person, everyone has seemed very curious to know what in my mind has changed, and why. It should go without saying that my thoughts are always evolving. Evidence for that is supplied by this blog itself, and the metamorphosis of the ideas and the shift in narratives it continues to reveal as I have new experiences or encounter new data or research. I’ve never made any pretensions as to the quality or accuracy -or permanence- of the judgments herein. Similarly I make no apologies for past postings and the obvious indiscretions wrought through my ignorance or unfettered enthusiasm, but neither do I wish to suppress them. This space is a living record of the progression of my thoughts and serves as an important reminder to me of my personal journey. I assume that journey will never be complete, and I fully expect my thoughts to change in future. So make of this blog what you will: there is no project of equivalent longevity or transparency in this field. But as for the evolutions alluded to in my original post on Acarigua, I mentioned encountering an orchestra possessing “technical and musical assurance, a mental flexibility, a level of intellectual discipline.” These qualities sound rather grand, but they are genuine characteristics of an ensemble that conductors sense very quickly, particularly when rehearsing works that encompass significant mental and technical challenges. Pictures at an Exhibition is one such work, and after an extraordinarily, uncommonly successful first rehearsal with the group, I was informed that I did many things very differently from conductor of the reading session held before I arrived. Normally this adaptability in an ensemble demands a critical mass of both experience and confidence: two qualities very common at the professional level, but very rare in youth ensembles. The degree of musical intelligence I encountered was completely unexpected, especially after many prior experiences with young orchestras around the world that performed with extreme rigidity and that seemed not just reluctant, but incapable of changing embedded patterns of performance. When I had encountered this musical inflexibility before I attributed it to another area of concern, that of literacy. I’ve seen how a heavy emphasis on technical proficiency and repetition almost always entails a corresponding relative neglect of musical literacy. Students confronted with the extremely complex, impenetrable symbol system that is music notation will often bypass it completely in favour of learning music entirely by ear. This is not laziness, this is intelligent disposition of energy and resources, and is very easy to do in an environment with frequent musical repetition. The unfortunate consequence of learning in this manner is that students find it extremely difficult to change, so deeply entrenched are the aural and muscle memories. But this universality of this assessment was first challenged then disproven in the space of 45 minutes as the orchestra in Acarigua sight-read Beethoven’s Concerto for Violin with remarkable ease. Literacy was clearly not an issue for this group. These more recent experiences did not negate the validity or accuracy of my earlier observations. They redirected my attention from superficialities of practice, such as the use of the orchestra, onto the practice within the group itself. 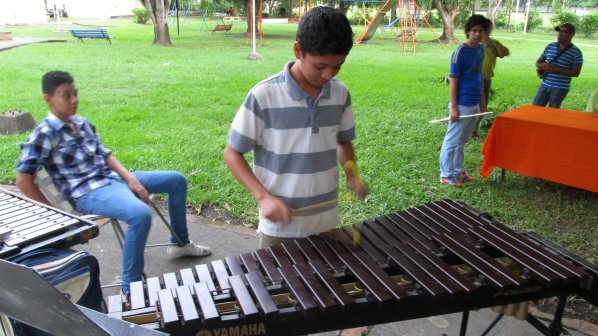 There are many orchestras in Venezuela and beyond that continue to play with the rigidity I encountered before, ensembles that are locked in to one manner of performance, ensembles that struggle to interpret the printed page. But I am reminded now that there are other orchestras, thanks to teachers like Roberto Zambrano, that know how to think and engage with music in both the aural and visual spectra. In short, it’s not just about the orchestra; it’s about what you do with it. One of the benefits of being at ISME was the opportunity to hear individuals like Brian Kaufman (Baltimore) or Jacobo Nitsch (Guatemala) start conversations about applying the tools differently or finding ways to make the existing tools work better: these conversations are long overdue, and are dependent on our willingness to challenge simplistic base assumptions such as orchestra = good. In North America and Europe, we have the resources, the existing infrastructure, the research and thus the responsibility to subject our practices to far greater scrutiny. Sistema claims a greatly expanded mandate (albeit a self-imposed one) over traditional education systems yet it shares largely the same tools. This is a complex issue to sort through, and obviously bringing everything to a halt won’t solve it. But failure to confront it openly and honestly will achieve nothing either. Despite the flippancy of my last entry, I’m actually quite grateful to have had the opportunity in Porto Alegre to interact with so many inquiring and fearless minds, willing to entertain and explore some very alien or uncomfortable ideas without necessarily accepting them. ← ISME Sistema in Porto Alegre – the Good, the Bad, and the Ugly. Interesting thoughts as always. I seem to recall a saying from the Russian/Soviet poet Vladimir Mayakovsky, which goes something like: “Art is not a mirror to reflect the world, but a hammer with which to shape it”. Sounds pretty Russian doesn’t it? I think all our tools should be expert ones, used by trained and skilled wielders, and we should expect great things from the children we work with. I have always worked on the basis that this was about excellence – not shortcuts or aural learning – to create pretend musician children. If we use art music as our hammer it must be the full deal, not a facsimile of it. I further believe that it cannot be about social change alone as a sole goal – it must be, I think, a three-way goal: Art: Education: Social Development in balance with each other. Only through excellence in all three, do you get rewards in all and each of these. They are bound together as a trinity. and of course the tools and skills we bring with us. Its a tall order to live up to your values in the face of these challanges. We are keeping a lot of saucers in the air: music literacy, ensemble playing, aural training, exposure to music performances, creativity and improvisation, academic achievement, social development, enthusiasm. O wait. is joy in there somewhere. In this semester’s curriculum development session some of these things are going to end up on the cutting room floor. All the more reason decision makers need the best information to choose saucers with. For most efficacy, How can we make sure that these decision makers are well versed in the best information available on critical windows of sensitivity. Perhaps this would help prevent us from using that hammer when the right size screw driver would be more appropriate. Music literacy has some of the same problems learning a second language has. If we wait too long to expose children to certain concepts of music or language they can become frozen or less flexible in their acquisition and production. If we are proactive using developmentally appropriate methods we can give them access to that flexibility freeing up the frontal lobes to play music or speak a language expressively. We don’t always have the luxury of working with them in those periods of sensitivity for reasons beyond our control. There in lies our ability to adapt curriculum to their needs and celebrate what they accomplish against the odds. I don’t know about the rest of you, but under the conditions I feel I am only providing a sample of what is possible. And you’re right to point out the vast complexities of what it is we’re trying to do, and the host of compromises that have to be made. My point was that as we look to make practice better, that we not get caught up in the trappings of practice but look to the mechanics of the engagement itself. I speak often about “mechanics” these days because it’s an area that we blissfully ignore. What precisely is that we do – that public school music doesn’t do – that provides social change? No easy answer to that, except in a theory divorced from reality.